According to a study by Nielsen Media Research, mobile Internet usage is growing at a rate of 30 percent each year. With more people surfing the Web using their smart phones, businesses must recognize the need for their websites to be compatible with these devices. By creating a separate site for mobile users, you are enabling them to experience faster browsing speeds, easy navigation and an overall improved user experience. Having a mobile website can also provide strong search engine optimization (SEO) benefits since it will boost your rankings on mobile-friendly search engines, such as Google and Yahoo. This article will explain why your business needs a mobile website, what your mobile website should look like and how you can convert your existing website into a mobile site. 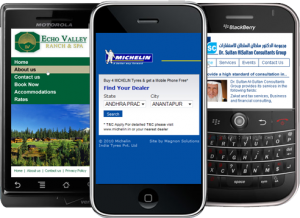 Why Does Your Business Need a Mobile Website? — With the variety of mobile devices to choose from, such as iPhones, iPads and Androids, the mobile Web is rapidly replacing traditional desktop browsers. As an increasing amount of people use smart phones to browse websites, businesses should not hesitate to reach this important mobile audience. Traditional websites don’t work well for mobile users because they don’t render correctly on the small, high-resolution screens of smart phones, causing sluggish browsing speeds and disfigured navigation schemes. To see what your website currently looks like on a mobile device, you can use the “GoMoMeter” tool at howtogomo.com. This site will also provide you with recommendations for creating a mobile-friendly experience for your business’ website. 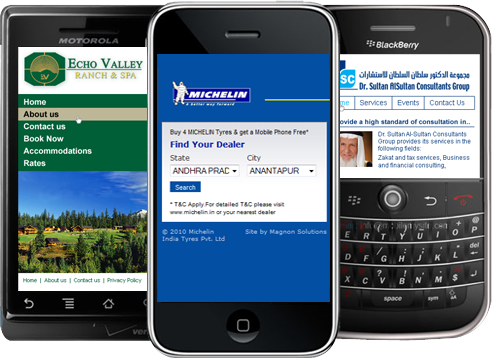 Having a mobile website will also provide your business with valuable SEO benefits. Since Google has a separate index for mobile content, having a mobile website is key to securing a higher ranking when people search on Google using their smart phones. Another benefit is that, since Google has a much smaller mobile index of content and not as many businesses have mobile websites, those who do have mobile sites will be at a significant advantage. What Should Your Mobile Website Look Like? — Most websites were designed to be viewed on a desktop monitor, which has much more space for displaying text and images. For mobile websites, it is essential to have a much simpler and less text-heavy design and navigation scheme. It is also essential to reduce bandwidth so that your mobile site will load faster and run smoother on smart phones. When designing a mobile website, it is important to prioritize your content and navigation scheme and only present the information that is most relevant to mobile users. For example, phone numbers, maps and directions should be easily accessible on your mobile website because these features are valuable to mobile users. A useful feature for mobile Web browsers is the “click to call” option. This feature allows users to automatically call the business by simply clicking on the phone number. If you are interested in creating a mobile website for your business, please contact The Public Relations and Marketing Group at (631) 207-1057 or johnzaher@theprmg.com. You can also visit our blog for more valuable articles, advertising spotlights and more. With its wide variety of cost-effective business tools, it’s no wonder why Google has secured its position as a global superpower on the Web. Google Business Solutions are a collection of services that are specifically directed at businesses and webmasters. Google offers tools to meet the needs of organizations and businesses of all sizes and boasts over 30,000 search and 3,000,000 Google Apps customers worldwide. This article, the first in a three-part series, will provide you with an overview of Gmail, Google Analytics, Google AdWords, Google AdSense, Google Chrome, Google Places and Google+. It will be followed by “An In-depth Look at Google AdWords” and then an article on “5 Additional Innovative Business Tools from Google,” which will focus on Google Offers, Google Engage and more. Gmail — With dozens of email providers to choose from, deciding on Gmail should be a no-brainer. This user-friendly email provider allows you to communicate and collaborate with reliable and secure Web-based tools. Gmail provides you with more than enough free storage space, significantly less spam, built-in text, voice or video chat and much more. You can also access Gmail from any phone, regardless of which device you use, to access your email on the go. For businesses, another comforting feature is that Gmail is entirely safe to use. Gmail uses HTTPS encryption to keep your mail and information secure. Although most Gmail features are free, businesses can purchase a flexible plan of $5 per month to access a variety of premium features that include Google Docs and Google Calendar. Google Docs allows you to securely store all Web-based documents, spreadsheets, drawings and presentations online. This feature also provides real-time collaboration, which allows users to edit these files at any time, so you will always have the latest version. Google Calendar is a Web-based calendar application that allows businesses to manage meetings online and minimize costs. You can send event invitations, share your calendars company-wide or between specific co-workers, invite guests on mobile devices and much more. Google Chrome — Google Chrome is a Web browser that combines a minimal, user-friendly design with sophisticated technology to make browsing the Web faster, safer and easier. Most people use their Web browser more than any other feature on their computer for searching for information, shopping, reading the news, watching videos and more. Therefore, it is essential to have a high level of security, speed and stability, which Google Chrome has mastered. Google Chrome is designed to be as fast as possible, up-to-date with the latest security updates and simple to use. Best of all, this Web browser is completely free to download on any computer. Google Analytics — This powerful Web monitoring tool provides users with rich insights into their website traffic and Web marketing effectiveness. Using Google Analytics, you can analyze data and determine which ads, keywords and other factors are most effective in driving traffic to your website and optimizing your Web presence. By consistently monitoring the information provided by Google Analytics, businesses can adapt based on what works and what doesn’t. Ultimately, this tool will help you create higher converting websites and strengthen your online marketing efforts. Google AdWords — Google AdWords lets you create and run ads for your business with a custom budget. Ads are displayed under “Sponsored Links” alongside the search results when someone searches on Google using one of your chosen keywords. This tool is so effective for businesses because you are advertising to an audience who is already interested in what you have to offer. In addition to text ads, you can run display and click-to-play video ads on Google AdWords. For more information on how to use Google AdWords, please read our article, “A Beginner’s Guide to Google AdWords.” Look out for our next article, which will include a more in-depth look at the features and options available for businesses on Google AdWords. Google AdSense — Google AdSense is a free platform that places AdWords ads on non-Google websites. AdSense allows Web publishers to earn revenue online by displaying ads on site search results, websites, mobile Web pages and mobile apps. By simply allowing others to place targeted Google ads on your website, your business can earn money. While displaying these Google ads, AdSense also lets you provide a Google search bar to your site users. By placing this search box on your site, visitors can search the Web directly from your website. Also, you will receive a “Top Queries” report that shows you what your visitors are searching for on your site. By reviewing the 25 most common searches conducted through this Google search box, you can identify additional topics, keywords or information to add to your site, based on what your customers or clients are searching for. Google Places — Google Places is an excellent tool for allowing businesses to get found on Google for free. Since 97% of consumers search for local businesses online, it is essential for your business to be found in search results. Over 90% of the local business Web pages on Google have not been claimed. Claiming your business page will put you at an advantage since local business results appear at the top of search results on Google when someone searches, using a certain location. By simply registering your business with Google Business Center, you can help potential customers find you on Google Places. On your Google Places page, you can include your location, contact information, photos, videos and any other information that you would like to communicate to your audience. Customers or clients can also leave reviews on your Google Places page. Google+ — Now open to all users, Google+ is a relatively new social media giant that has taken the Internet by storm by reaching 10 million users in its first 16 days, from June 28 to July 14. Google+ improves upon the features of existing social media outlets. Like Facebook, you can create a profile, complete with personal information and photo albums, comment on other users’ content and share posts. Google+’s “+1” button also works the same as Facebook’s “Like” icon. Like Twitter, anyone can follow you and you may follow any user by adding them to your “circles,” no matter who they may be. The “Circles” feature allows users to organize contacts in specific groups. For example, you may have a circle specifically for friends and then one only for business contacts. Google+ also has many other unique features such as Hangouts, Sparks and Huddles. The Hangouts feature allows users to engage in live, face-to-face chats involving multiple people at a time. Sparks delivers popular content from across the Internet on any topic you choose. Huddles, available on Google+ Mobile, is a unique group messaging feature that allows multiple people to chat in one place. With the continued rise in the value of social media and the resulting ability to hyper-target ads, many publications have now realized the gold mine on which they are sitting. When newspaper subscribers or website visitors give their email addresses to these companies, they often “opt in” to receive certain emails. Maybe it’s a weekly sports update, or daily business headlines; these subscribers have now opened themselves up to be advertised to in a whole other way. Because the reader can choose what emails he wants, based on his interests and preferences, he effectively self-selects his demographic. If he indicates an interest in local restaurants and entertainment, proprietors of such goods may rightfully believe that this reader will be likely to take an interest in their offerings as well. Some news sites have even gone so far as to offer their subscribers “opportunities from our advertisers.” These emails are completely taken over by an advertiser and go out to the site’s opt-in list on the advertiser’s behalf. I wanted to go over some of the ways that advertisers and news sites are working together to bring relevant content to interested consumers locally. Newsday has three such opportunities. There are eight themed enewsletters that go out either Monday through Friday, or once a week. All of these newsletters allow for a 3.5×3” cube ad near the top of the email. They can be targeted to subscribers in specific zip codes and paid for by the thousand. Newsday also offers an email message called AdMail, which allows advertisers to completely take over an email with their own text and images. Though the advertiser will never be given the subscriber list, they will receive a click-through report informing them of who and how many took interest in their ad. Newsday AdMails can only be targeted by county and go to about 60,000 subscribers in Suffolk and 45,000 in Nassau at $50/thousand. The third option for advertisers looking to reach Newsday subscribers is the new Daily Deal program. This is a collective buying opportunity, similar to Groupon. The advertiser offers a product or service for at least 50% off and splits the resulting proceeds with the email agent. Newsday’s version goes to over 10,000 subscribers and includes a free half-page print ad and banner ads on the website during the day their deal is scheduled to run (only one advertiser deal per day). There is no up-front cost to the advertiser, though the program is what is known as a “loss leader,” since vendors end up only receiving roughly 25% of the usual price for an item. The LI Press also offers banner ads in their weekly KIOLI (Keep It On Long Island) newsletter, which goes to 50,000 subscribers, and takeover AdMail messages that can target specific groups of people. The AdMail groups can be customized by zip code, gender, age and interests. Depending on the specificity of the list, the cost per thousand can be as high as $100 or more, but this price is supported by the quality of the targets. Unlike the Newsday AdMail, which is sometimes wasted on too broad a demographic, the LI Press AdMails really target those likely to have the greatest interest. Of course, these ads also include the valuable click-through reports. The LI Pulse offers their Executive Eblasts, which go to the “über consumer[s] and VIPs of the region,” but are, in our opinion, overpriced at over $1,500 per email to a single list of about 7,800 subscribers ($192/thousand). Any of these options provides a cost-effective way to target the consumers most likely to become your customers. For more information, or for help structuring a comprehensive marketing plan, contact PRMG. • Pick a domain name that has potential keywords in it. • Choose to pre-pay your domain for a few years in advance. Genuine sites plan on staying around for a while. • If you’re using a shared server, you may want to do a blacklist check. If you have spammers on your server, you share the same IP address with them and so you may be considered a spammer. • There are multiple ways to reach your home page; make sure your site is set up to redirect the other ways. For example, yourcompany.com, www.yourcompany.com, yourcompany.com/index.html, www.yourcompany.com/index.html all should redirect to the one you pick. Google considers these to be four separate pages, instead of one. • Name your Web pages using keywords, for example, www.yourcompany.com/keyword1-keyword2.html. • Never block your domain registration information using a privacy feature. Doing so may cause search engines to consider you a spammer for your anonymity. • Use the words “image” or “picture” in your photo alt descriptions and captions. A lot of searches are for a keyword plus one of those words. • Stay away from developing websites with Frames because you cannot link to a specific page of the site. Use Flash and Ajax minimally. Search engines cannot read anything inside Flash and cannot see inside the Frames. • If you MUST have a splash page with Flash or something of the sort, you also MUST place content and link text below it. • Keep your content text-based as much as possible. Search engines cannot read text that is embedded in an image. If you use images, make sure you assign an alt tag and title tag to each image. An alt tag is seen when the image cannot be displayed. It is also used by the visually impaired. • Keep your content changing and fresh. Outdated content will rank lower than more recent content. • If your site’s content does not change often, then your site needs a blog. Once you have a blog, it’s important TO BLOG ON IT or you will receive little to no results. Crawlers crawl for content; if your site’s content doesn’t change, the crawler will come back less and less often. Three blogs entries a week is proficient. • You should have a good content-to-code ratio. This means, even though you enjoy spinning images, with cool effects, and flashy junk, your content-to-code ratio is poor. A blank white page with optimal content will always do better than code-stuffed junk pages. • If you are writing a substantial article, then you are most likely dealing with sub-topics. These sub-topics should be split in to separate pages with their own optimizations. • Put high-quality outbound links related to your Web site. This doesn’t mean you should link to your competitor; it means you should link to a site that is within the realm of what your site is about and use the keywords considered by Google for that site. This shows users that you are in good faith and not a spammer. A higher ranking will give you more traffic than outbound links. People leave when they haven’t found what they’re looking for; chances are you’d have lost them anyway. • Pick relevant keywords that potential customers may search for. Try to stay away from very popular keywords. The more competition for a keyword, the harder it is to rank high with it. Try narrowing your keyword phrases by adding a location or town. • Use keyword phrases in the content on your pages and in the headings. Repeat keywords throughout the content making some bold or italicized – this tells search engines that these words are more important. Make sure each page has a good amount of content – search engines love a lot of text. • Don’t try to cram keywords and pull a fast one on a search engine spider. Programmers are constantly rewriting code to find people who try to abuse the spider, and they will find you eventually. So basically, BE LEGITIMATE – write content for a reader and NOT a spider. • Use keyword phrases in the title of each Web page. Each page should have a unique title. Don’t list your company name in your title – most potential customers won’t be searching for you specifically. The words towards the beginning of the title should be the most important. • Use the keyword and description meta tags in your site. Each page should have unique keywords and descriptions. • It is always best to use keywords in anchor text (links). “SEO tips” is always a better anchor text than “Click here.” Crawlers also consider the surrounding text nearest to the anchor. • Give each page a focus on a single keyword phrase. Don’t try to optimize the page for several keywords at once. • Rather than repeating the same keyword over and over again, it is best to use the keyword’s synonyms. This keeps your content more interesting for readers, and Google won’t think you’re a keyword abuser. • The best places for juicy keywords is the beginning and end of your page. Sometimes that’s not where it “looks” best to viewers; in such cases, it’s optimal to use CSS to place your keywords at the top of the source and not change the visual layout. • Repeating the keyword in your content too often. • Redirecting the home page. • Using small pixel text or hidden text on your pages. For example, white text on white background. • Cloaking: this means displaying a different version of your web site, depending on the IP address of those accessing it. • Registering many domains and interlinking them all. Many of us remember the 1989 hit movie Field of Dreams wherein Kevin Costner plays an Iowa corn farmer, hearing voices to “build it and he will come,” builds a baseball diamond and the Chicago Black Sox come to play on the field. This is then followed by thousands of cars appearing out of nowhere to watch as the movie comes to a close. Too often, I have experienced almost the same mentality with clients who have recently started a new business. Great ideas and good business models do not always lead to success. How often have you heard someone say, “that actually ended up costing less money than I thought it would”? Rarely ever, if at all. Starting a new business, even those that are not retail or professional, always seem to cost more money than the business owner planned. Retailers, restaurants and even professionals often spend more money than they budgeted to complete build-outs, buy equipment and pay professional fees. They are then often tapped out by the time they open the doors. Unfortunately, the hard part has just begun. Usually, it is marketing that suffers as businesses struggle to keep the doors open and now have limited means to spread the word about their creation. For any business owner, it is imperative to include a marketing plan as part of one’s business plan and to budget funds for at least six months to a year. The following outline describes the steps I would recommend along with some practical, cost-effective suggestions. There are a number of considerations here, including legal factors such as whether your name may violate someone’s trademark or whether the name is not generic so that you will be able to trademark your name. You want to choose a name that is both unique and also describes your business. One of the first considerations is whether the domain name is available. This has become increasingly important and is now the most important factor if your business is going to be primarily Web-based. Go to www.networksolutions.com or www.GoDaddy.com. Both these sites let you see the available domains and allow to purchase and manage your domain name(s). In addition to the .com extension, you will likely want to purchase .net, .us, .biz and others, including .org if yours is a non-profit organization or association. Choosing a location is a very important factor. Choosing the ideal retail location is a little bit beyond the scope of this paper, but to simplify matters, you want to obtain the best location available that is within your budget. You want to research your demographics. Is this the type of business that can be supported by the local economy? What competition will it face? Will it be located near similar and complementary businesses? How much exposure will it have to foot and vehicular traffic? What type of signage can it have? You are going to want to take full advantage of signage opportunities. Does it make sense to lease a location rather than buy? What’s the minimum lease commitment and deposit I need to provide? For home and web-based businesses and professionals, you have many more options. I would recommend virtual office space (shared or part-time space) over renting, at first. Obtaining a professional office address and then meeting prospective clients and business associates at a virtual office is an excellent way to get started, allowing you to put your resources in other areas and work from home at the same time. It could put you in a better location to buy office space later on, rather than wasting funds on renting. If you are expanding, virtual offices also provide excellent opportunities to create the presence you need without the added expense. Developing a logo and defining your brand is a very important step. You want to take the time to develop a logo that provides you with an eye-popping, unique visual representation of your business and the goods or services you provide. The logo will become the look of your company and will be incorporated into your website, as well as your marketing and collateral materials. Your brand should have been addressed in your business plan. Take the time to describe your business. What makes it unique? What consumer needs does it address? You can use this write-up for your company overview page of your site and for your marketing materials. Before you open your doors, before you print a business card, you need to build a website. For your site to be successful and to obtain high search engine ranking, you want to begin by asking yourself, “How am I going to develop outstanding content that is found in search engines, brings people back to my site and compels them to share my content with others?” In addition, since search engines rank pages that are updated more frequently higher, when choosing pages for your site, ask yourself whether this is the type of content that lends well to regular updating. You also want to consider whether to have a blog. For starters, we often suggest that a blog be incorporated into a website to help with the optimization of the site. The blog can be spun off later. Your site should include social media links, an easy way to e-mail you, a contact page with a contact form and downloadable content. For professionals, this could be a guidebook or brochure that provides valuable information to visitors; information that they will be willing to give up their e-mail address for. The contact form and download forms can then be linked to e-mail programs such as Constant Contact or StreamSend. This way, you can set up automatic e-mail triggers and then send e-newsletters and other content to visitors. For retailers or restaurants, this can be as easy as having a downloadable coupon. As your site’s content comes together, you also want to optimize the on-page content and engage in off-page optimization techniques to improve your site’s backlinks and authority with search engines. As you get ready to host and launch your site, be sure to set up Google Analytics to measure your traffic and take a benchmark of your keyword ranking using software such as Web CEO. Now that your website is up, you can now turn to putting together some marketing materials. Using your logo, set up and print business cards with your website, e-mail and other contact information on them. You’ll also need to set up letterhead, but more and more businesses are using Word documents and color laser printers to print letters as needed. You will also need to print envelopes; however, considering the difficulty some laser printers have with printing envelopes, you may consider purchasing envelopes. Use an online printer such as Vistaprint or PrintPlace. You should also consider putting together a brochure at this point. You can place it on your site as a PDF download, e-mail it and use it during your initial marketing programs. You may also want to consider purchasing presentation folders. These are good to use when providing proposals and other information to prospective clients or to provide to clients to hold your information in. One of the first steps you want to take when starting a business is to pull your relevant contact information together. In fact, many entrepreneurs begin collecting contact information about prospective clients and customers long before they go out on their own. You’ll need to do some research to determine the best system for you. Will Microsoft Outlook and Access be sufficient to create your databases when used in conjunction with an e-mail program such as Constant Contact or StreamSend? Will you use your Point of Sale software? Do you need an online system such as Salesforce.com? The contacts you have made are likely going to be your first customers or clients and your best referral sources. You want to create an easy system from which to mail, fax, e-mail, and engage them. Especially for those engaged in a business to business (B2B) field, you’ll need to consider what types of databases and e-mail lists you want to purchase and how you will work with that information. Which social media platforms are best for you? Key in on the big three: Facebook, Twitter and LinkedIn. As a rule of thumb, if you are a retailer or have a business that provides services that anyone can use, then make Facebook your first priority. If you are primarily involved in B2B or provide professional services relying on referrals, then start with LinkedIn. Twitter can be very effective for restaurants and retailers to communicate microblogs to followers and to re-distribute e-newsletters to wider audiences. Upload your contacts with LinkedIn to invite others to connect with you and use the search function on Facebook to make friends and on Twitter to follow others, who will often then follow you. Once you open your doors and are ready to do business and have built your online presence with your website, blog and social media, it’s time to do a press release announcing your new business. The press release should draw upon your branding strategy, describe its uniqueness and the customer needs it seeks to address. It should be targeted to business reporters, trade publications, local newspapers and online sites that allow you to post press releases, such as PRLog. The release should be optimized with keywords linking back to your website and your domain included. As the release gets published online, this will help to build backlinks, usually with sites with high authority, helping to build page ranking. If you have a retail establishment, restaurant or sizable space in an office building, consider a grand opening and ribbon cutting ceremony. It is often better for restaurants to be open for a period of time, at least a month or two, so that staff can be adequately trained and the kinks worked out before sending out a press release and holding a grand opening, as these will also often invite reviews which you will want to score well on. Use a PR firm or a service such as Marketwire to distribute your release. You are now doing business. To this point, depending on how much your website cost and whether you had a grand opening, you probably spent between $5,000 and $10,000 on marketing. Now it’s time to be proactive and start getting the word out. For new businesses especially, you want to go after the lowest hanging fruit, bringing the greatest return on your investment at first. Look at your contacts and prospect lists that you may have pulled together or purchased. Start by sending an introductory letter with your brochure or another direct mail piece to your contacts and prospects. You can do the same using e-mail and include links to your website and a link to download the brochure. By using an e-mail program such as StreamSend, you’ll be able to track who opened and clicked through to your site, or downloaded your brochure. You’ll be able to use this information to prioritize follow up. After your introductory mail and e-mail has been sent out, you’ll want to regularly communicate via e-mail using e-newsletters. Use the content you develop to update your website and communicate via Facebook, LinkedIn and Twitter. Consider purchasing additional contact lists or using Chamber of Commerce, published association and other prospect lists. Continue to track your click-through activity and develop materials to send to prospects. For professionals, consider making follow-up phone calls, e-mails or further engage using social media. Unfortunately, not everyone will get your e-mails or open them. Consider supplementing e-mails with regular direct mail or newsletters to your current customers and prospects. At this point, you are probably also doing some traditional networking at appropriate venues that put you in front of prospective customers. For this, it is often more effective to go to their events, conferences, etc. in your targets rather than general chamber or other public events. Consider taking tables at conferences and sponsoring lectures. You may also want to develop a lecture or webinar for your prospective clients. Some professionals require continuing education. Look into whether your lecture can get accreditation. You may even be able to charge for attendance. The first step is to create compelling content. For professionals, this often takes the form of a free report or guidebook that will provide the reader with valuable information, which they will be willing to give up an email address for. The content should be mostly informational and not a sales pitch. There should be very little mention of the organization, perhaps with the exceptions of authorship and contact information at the end of the piece. Very often, this takes on the form of a downloadable brochure, white paper or eBook. The material should be written with the end-user in mind and not be overly technical (unless of course this is your target market). Some examples: for attorneys, it could be a guidebook on “What I Need to Know before I Purchase a Home”; for an ophthalmologist, “Will I Benefit from Laser Eye Surgery?”; for a home health care provider, “The Advantages of Using a Home Health Agency”; for a retailer or restaurant, you could just offer a coupon. A landing page is little more than a Web page that contains specific content. Landing pages can be built into websites, but they can also be used as part of Web advertising campaigns. When used in a Web advertising campaign, it is suggested that they provide access to your entire Website, but the goal is for the visitor to interact with the content on the page. To accomplish this, we suggest not having navigation links, but instead a text link in the body of the text inviting the visitor to visit your site. The landing page should also include brief descriptions of the downloadable content and the services of your organization, as well as an image of the content and a short form. You may also want to include a video, such as a TV commercial. The contact should be kept to a minimum and ask for just a name, company (if B to B), email address and phone number. It should also have a check box asking if the visitor wants to be contacted to set up a free consultation or meeting. However, we recommend that the only required fields be the email address, perhaps also a phone number if the visitor requests a meeting. Use Google, Bing or Yahoo! AdWords or Facebook to bring traffic to the landing page. Target your demographics and keywords like you would for any other AdWords campaign. However, in this case, the ad should promote the availability of the free download. Monitor the ad’s performance using the advertising platform and Google Analytics. Test different offers to achieve the best results and to maximize your costs per click. As visitors interact with your landing page, you will receive a form indicating that someone has downloaded the content or requested a consultation or meeting. You should then contact anyone requesting a meeting immediately. For the most efficiency, you want to program your contact form to dump information into an email program. (Our firm uses StreamSend.) You can also do this manually. We would then recommend that you set up Triggers. Triggers are e-mails that can be programmed to send automatically based on a database field, such as the date/time when an entry is created. This allows you to send out an email to a lead 24 or 48 hours after they have downloaded your content, providing them, for instance, additional content they may be interested in or a sales offer. Multiple Triggers can be set up. Not everyone makes buying decisions at the same pace. Someone may have visited your site very early in their buying process for the purpose of researching the problem they have. Other visitors make buying decisions very quickly. The goal is to interact and nurture your contacts over time. For instance, on the initial landing page, we provide an opportunity for someone to contact you by phone or email to request a meeting. We use Trigger emails to provide automatic follow-up shortly thereafter. We also recommend that you develop an e-newsletter that you send out to clients and prospects at least on a monthly basis. This will help you to ensure that your leads are nurtured over time. You can invite these leads to connect with you using social media. We hope this article was useful to you. As always, if you have any questions or would like to see samples of our work in this area, email johnzaher@theprmg.com or call us at (631) 207-1057. This leads us to the broader category of off-page optimization. As you review your Google Analytics results and keyword rankings, you may find that you perform better on Yahoo! and Bing than Google for certain keywords. Your keyword rankings depend on several broad factors. The most important factor is the competition you face. The broader the word, especially if it describes an industry or service, the more difficult it is to rank high. When developing your keywords, you may want to begin narrowing your selection. This is often done by adding a geographic qualifier or being more specific with your keywords. Broad-based keywords do little to help you. If you are just launching your site, it is often suggested that you include some less competitive keywords to start generating visitors and then move into the more competitive words over time. The second major indicator of keyword ranking is the content of your pages and on-page optimization. If you do a good job here and regularly update your site, you should perform well with Bing and Yahoo over time. However, when it comes to Google, it is often more difficult to rank high. In addition to having good content, updating it regularly and having good on-page optimization, Google bases its rankings on the authority of your web site and, unfortunately, creating authority doesn’t happen overnight, regardless of what some online optimization companies will tell you. If a consultant promises you immediate results, he or she is either engaging in potentially blacklisting techniques or they are a complete scam artist. Frankly, the more effort you are willing to put into your site, the more you will get out of it. Google’s authority system of ranking is based on the concept of citations. The idea is that the more other web sites “cite” you (through links), the more authority you must have. However, not all citations carry the same weight. For this reason, news sites and popular blogs rank higher with Google. Sites with an .edu extension rank higher. In sum, the more quality back links to your quality and relevant content, the better your site will perform with Google. You can generate your own one-way inbound links by posting on Forums, and making Comments. ** If the anchor text is the H1 of the target page, this is huge SEO points. See above. Since links from .edu domains are given nice weight by the search engines, run a search for possible non-profit .edu sites that are looking for sponsors. As you work towards optimizing your web site, it is important to remember that SEO is not a one-shot process. The search landscape changes daily, so expect to work on your optimization daily. Before we discuss off-page optimization techniques using public relations and social media, it is worth noting that there is an alternative to building traffic on the Web, through advertising. Once your site is developed with the buyer in mind and it has good content that is regularly updated, along with ways to engage and capture information from your visitors (this will always be necessary and will help you with your rankings anyway), then you can begin Ad Word campaigns on the various search engines. To improve your performance, develop professional looking landing pages with strong graphics related to your ad that provide the information that the visitor is looking for and draws the prospective buyer into your sales cycle. You may want to include links to other pages on your site (but you don’t have to), and you certainly want to include a product demo, a free download, a request for a free consultation and an e-newsletter sign up form. All of these “calls to action” are designed to capture information about your visitor and to maintain contact with them, especially if they aren’t buying your product or services today, which most won’t be. However, keep your forms short and limit the amount of required information. The important thing is to give something of value to your visitor and then to nurture them over time. Perhaps one of the best examples of this is Amazon. Have you ever ordered a book from Amazon and then find that you are regularly receiving information about recommended titles specifically targeted to your prior purchases? That is how one company nurtures its buyers. If you are regularly generating content for your site and are engaging in an ongoing public relations and marketing strategy, it will be easy to maintain communication and nurture your new prospects. It has never been more important to engage in public relations to build your web-based content and web site authority. What should we write about? The important thing is that it doesn’t have to be a big story or major announcement. Post your news releases in your online newsroom, or if it is an article, on the articles page or blog. At a minimum, especially if you are a professional services organization, such as an attorney, accountant or psychologist, you should commit yourself (or hire someone) to generate at least one monthly column on an area of your expertise. This content has many uses and can serve as the basis of your ongoing marketing program. You can send it to reporters, post on web sites to generate back links, post using social media bookmark services and provide content to your social media followers. Rather than writing a full release, you can comment about items in the news. Blogs and Twitter are great for this. Post your views on your blog and other blogs. As you post, provided that comments are not marked as “no follow,” a back link will be generated, helping to promote your site. Develop a topic to regularly update people on. Use the blog or social media, such as Twitter. You are not only creating content and back links, you are positioning yourself as an expert. Over time, you will also generate additional attention from bloggers and traditional news media. When writing your releases, you want to optimize the release by incorporating keywords and links to bring people to landing pages on your site, such as a free trial, or to a registration page. You also want to include social media tags to improve the likelihood that the release will be found. Lectures and Events, whether your own or ones that you are participating in. Blogs: How to Use Them? The topic of creating and promoting blogs will be discussed in a later article. For the purpose of building and creating Web traffic, one of the most important questions to ask is if it should be incorporated into a web site or be free-standing with its own domain. The first thing to ask is “Do I have the time to develop, maintain and promote two domains?” For most small businesses that can commit to only a limited amount of time, you may want to incorporate a blog into your web site. This will help to keep the web site updated and improve its ranking with search engines. However, having a separate blog site will help you better position yourself as an authority by separating your overt marketing (your organization’s site) from your blog whose primary purpose is to promote your site and position you as a thought leader. This will better enable you to utilize social media since you’ll be asking people to link to and promote a site that doesn’t directly promote your organization. Social media networking sites may not be as helpful to build your site’s page ranking as the “follow on” is often turned off. However, several social media bookmarking sites should be used including: del.icio.us, Digg and StumbleUpon. You’ll use social media networking sites, such as Facebook, Twitter and LinkedIn to promote your Web content to your friends and followers. Building an effective web site has become the most important part of an organization’s communications and marketing plan. However, to be successful, it requires an ongoing commitment and resources. In the end, your web site will become a driving force behind your business or cause and you will help to position yourself as a leader in your industry.